The new Osram Ostar Projection Cube LED for embedded projection for brilliant projected colors from a smartphone. An integrated miniature projector that can display images on a much larger surface than existing displays is the next giant leap for smartphones and cameras. This is known as embedded projection and uses LEDs as the light source. The greatest challenge so far for lighting technology has been the limited efficiency of the green light emitting diodes. This is because high brightness is essential if the projected image will be seen with ambient light. The Osram Ostar Projection Cube from Osram Opto Semiconductors is the perfect answer. Efficient LEDs for red and blue light have been available for some time but LEDs that produce green with acceptable output have been rare. The new Osram Ostar Projection Cube from Osram Opto Semiconductors has now plugged this important gap. At 110 lumen per watt (lm/W) it is much more efficient than all other previously available green LEDs in the embedded projection sector. For the first time, the Osram Ostar Projection Cube enables high output to be achieved in embedded projectors. "The new LED almost doubles the brightness in smartphone applications so embedded projectors with a system brightness of up to 25 lumen are possible", said Wolfgang Schnabel, Marketing Manager Projection at Osram Opto Semiconductors. This means that the image is clearly visible even with ambient light and, thanks to the efficiency of LED technology, the projector can also be used in mobile applications with limited battery capacity. The new green LED is available in two versions – with a 1 mm edge length chip and with a 0.75 mm edge length. The Osram Ostar Projection Cube is therefore suitable for all standard imager formats in mobile terminals. The two LED versions are also very bright. Depending on the size of the chip, they produce 260 lm at 700 mA and 2.3 W or 130 lm at 350 mA and 1.2 W.
This high luminance from a small surface area is made possible with the aid of special encapsulation. This sharply defines the light surface so the light is emitted from this defined surface without package reflections. 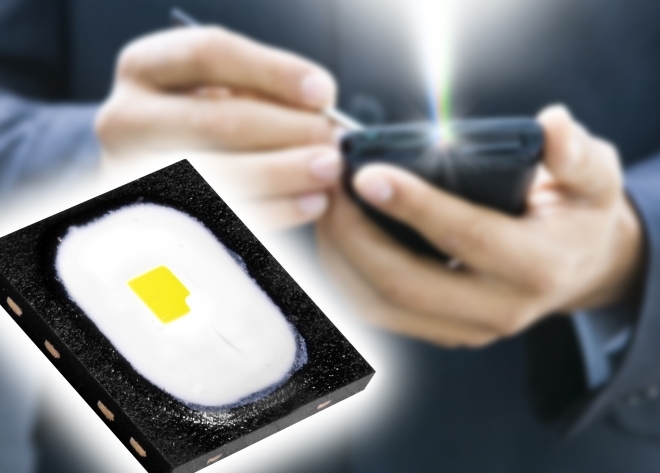 With an area of 3.8 x 4.1 mm² and a height of only 0.6 mm the new LED enables extremely low-profile projection units to be designed – ideal for modern smartphone and camera designs. Osram Ostar Projection Cube does not have a glass cover, which means that external optics can be placed very close to it and the light can be used efficiently. Francis Nguyen from Osram Opto Semiconductors will present this new LED at the Projection Summit 2012 in Las Vegas during his talk on the "Evolution of LEDs used in Picoprojectors" (June 11, 2012).